Home Sweet Life: Math and Science in High School ~ What's a Mom To Do? 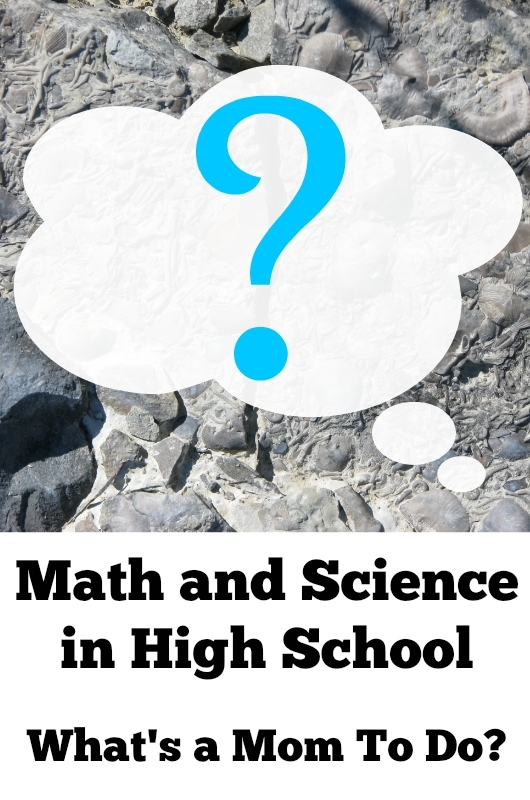 Math and Science in High School ~ What's a Mom To Do? What's a Homeschooling Mom supposed to do with Math and Science when her students reach High School? Step one: Do NOT panic! There are a lot of great resources available to help High Schoolers learn about math and science. As the Mom, you and you husband will have two main choices: dig deep, or delegate! Many of the families we know do some of both! Digging deep refers to focusing on working alongside your High Schooler, either helping teach the math and science to them, or learning alongside them so you can study together. Many Moms ask the Dads for special help at this stage. If your husband is better at math than you are, admit it and work out a family schedule where he can be available to teach and/ or help after dinner each night, or perhaps schedule time on the weekends. No one ever said Math had to be the first subject of the day! Delegating means wisely choosing a co-op class, an online resource, or DVD-based class for your High Schooler to learn Math or Science from someone else. These options often cost more money than a traditional textbook, but can be an area where your teenager is learning real independence in their studies as they need to meet someone else's deadlines. Some students are able to tackle these subjects on their own, and really don't need much help. Others need a lot of direction and encouragement. If your student has been doing a lot of independent study work, they may be able to figure out higher level math just by reading their books. Some Science books are designed to be used independently. If your student is familiar with Charlotte Mason's teaching style, High School Science will be an extension of what they've already learned, not something totally new. Wherever you student fits on the scale of dependence in their studies, take time together to choose their math and science options. Having input into how they will be expected to learn can bolster your students interest and their confidence in being able to complete the course. It is still possible to piece together a full set of High School Science courses from free or almost free resources (thank you libraries!) However, many parents choose to invest in an actual curriculum, or set of books to guide their students, especially in subjects like Algebra 2, Chemistry and Physics. At our house we've done some digging deep, and some delegating of the math and science opportunities. I would love to be home all the time and dig deep with the girls and learn, or re-learn, those higher level sciences and brush up on the math I haven't used much in the past 20 years. Our reality is that I work about 30 hours a week outside the home, and I need to choose wisely what subjects the girls do mostly independently, and which ones are more Mom and Me activities. What have we done so far? Here is a list of some of the resources we've used. If it is something we've done a review of, it will be linked to the review. Our girls have used resources from both Creationist and Evolutionist Worldviews for Science. I think it is important that they can read and discern the differences between the two. While we believe God created the world, and that evolution is a lie, they have found that much of the world has a different starting point. Being able to use resources from both sides while they are still here gives us opportunities to discuss the differences in the safe environment of home. Instead of waiting until they leave home, and possibly have the opposition undermine their faith, reading and dissecting the evolutionary model now has actually strengthened their faith. Firmly planted children can stand against a lie. Lest you think we only use textbooks, rest assured, we still do field trips for Science in High School! Besides hiking in multiple State Parks for geology and biology, we've been fossil collecting in Ohio, to the Carnegie Science museum in Pittsburgh, PA, to the museum of Science and Industry in Chicago, IL, to the Old lighthouse museum in Michigan City, IN, to the Indiana Dunes National Lakeshore, to see wild mustangs in Oklahoma, and to several zoos, aquariums, and arboretums! If you're face to face with math and science for your High Schooler, or soon-to-be High Schooler, start first by looking at your state's requirements. Next, look at what college are asking for in the math and science subjects. Then take those guidelines and decide together how to meet them. Your student may not have any interest in college right now. That's ok, not everyone should go to college. Many students are better suited for other options after High School. Your goal as a parent should include helping them prepare for wherever God calls them after graduation. We have decided the girls will take all the courses necessary to get into college, and they can decide later whether or not to go. One probably will, one probably won't. If your state required two lab sciences, find out if they are specific. Must they be in Biology and Chemistry? If not, perhaps your student would rather take Botany or Anatomy & Physiology as their second lab science. Arlene did a year of integrated Chemistry and Physics her Freshman year because her interests point to spending the next three years focused on Biology-related courses. She will be taking Biology, Advanced Life Science: Plants and Soil, and probably some sort of Wildlife management course. One of the great joys of educating your children at home is being able to tailor the courses to the student. Don't let what YOU did in High School determine what your teenagers study during their High School years. Want more ideas? Click on the links below and find out what our friends do for Math and Science! P.S. We were also encouraged to write about History this month, but we've decided to save that for next month, when we talk about Language Arts. Back to Homeschool Blog Hop -Don't Miss It!